SAXON - DENIM AND LEATHER EXPANDED EDIT. (DIGI) | Online Shop | Wizard LTD. Album: "DENIM AND LEATHER EXPANDED EDIT. 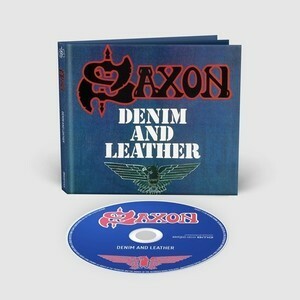 (DIGI)"
Saxon’s fourth album, Denim And Leather was originally released on 5th October 1981. It was recorded at Aquarius Studios in Geneva. Arguably their most successful record to date it spawned the classic singles ‘Princess Of The Night’, ‘Never Surrender’ and the song ‘And The Band’s Played On’, which was inspired by their appearance at the inaugural Monsters Of Rock festival in 1980. This edition contains the B Sides of the ‘Never Surrender’ single and seven live tracks recorded on the Denim And Leather tour of 1981.